How Do We Meausure the Plates? Earthquakes, Volcanos, and mountain ranges are evedins of plate movment. 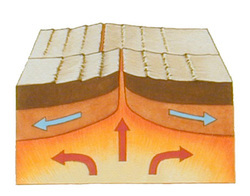 The theory of plate tectoincs can suggest that convection currents that are inside the earth can effect the crust differntly in the different locations. Have you seen how the plates move scince 1995? New data confirms that the parts of the crust are moving.